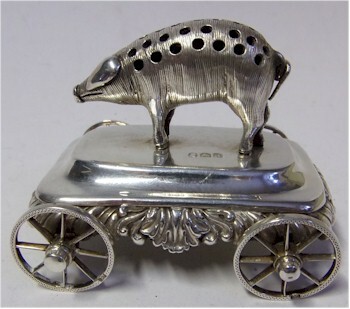 Bearnes Hampton & Littlewood (Antique Silver Auctions): This Little Piggy Went to Market! Martin McIlroy, Head of the Silver Department, marvels in a delightful late George III silver novelty toothpick holder, which is so rare that he has never seen an English example before. He is certain that it will bring home the bacon. A rare late George III Silver Table Top Novelty Toothpick Holder, London, 1819 (FS29/151). This late George III silver novelty toothpick holder is to be included in our two day Fine Art Auction on the 19th and 20th January 2016. Produced in London in 1819, this 'Pig on wheels' would have graced the dining table of a wealthy Georgian gentleman and would have been pushed from person to person around the table. Stuck in the holes in its back would have been quill or wooden toothpicks, which were used to dislodge any food stuck between the teeth. Another view of this delightful and rare piece of Georgian silver. 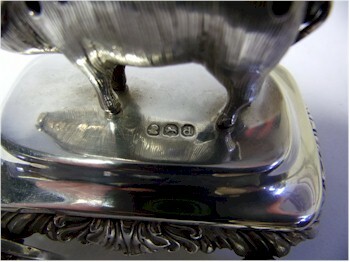 The stand is hallmarked but lacks the maker's mark and each of the wheels is marked with the lion passant, whilst the pig bears three marks only the duty mark is clearly visible, however due to the wrinkled decoration of the pig's skin incising into the other marks, they are illegible. In over thirty five years' experience, I have never seen an English example of this type of toothpick holder. Similar examples were produced in Portugal, normally of a thinner gauge of silver and usually on a wirework stand without wheels. The more usual type of toothpick holders were typically small, narrow oval boxes made from ivory or mother-of pearl containing 9ct gold toothpicks and a mirror panel to the interior of the lid. One can only assume that passing the toothpicks around was rather like passing the port, a communal activity. 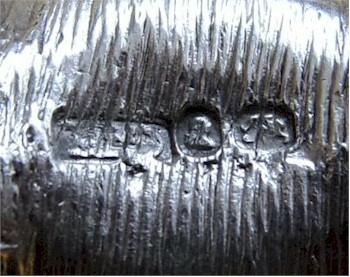 A close up of the hallmarks dating this piece of silverware to 1819. 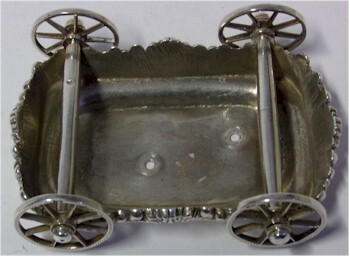 One of the wheels from the silver novelty toothpick holder. 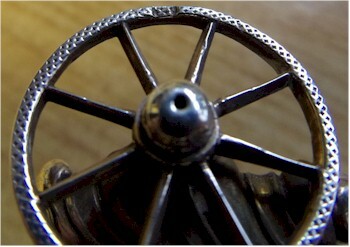 Another close up, this time of a wheel, showing the lion passant. 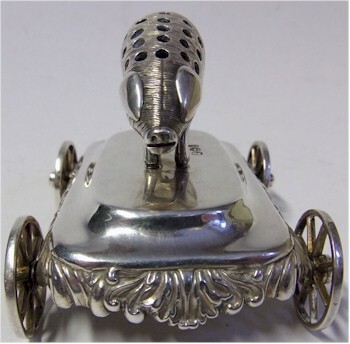 So this rare piece of antique silverware not only appeals to the specialist collector but also to pig lovers around the world and with an estimate of £800-£1,000 this little pig will certainly be bringing home the bacon. The underside of this rare piece of English silver.